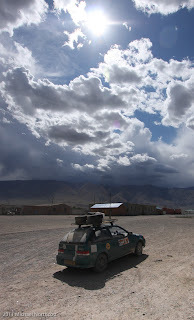 There are no roads in Mongolia. That’s not entirely true. There are roads, some of which are paved after a fashion, but they amount to a paltry 1,500-ish kilometers in a country twice the size of Texas or three times the size of France. The rest of the unasphalted populace runs around on highways that are really only gravel reinforced dirt roads. The good news is if you don’t like the track you’re on, go ahead, make one of your own. Who knows? Others may follow and you’ll have created a new road. Plus driving off the beaten path rubs the sage and releases an incredibly fragrant bouquet. Liberating as it is, this freedom comes at a price. Just when things are going smoothly and you’re haring along at 40mph, flying through swales of rock and sand like an out of control HotWheels racing car, you’ll run smack into a ditch, a car killing boulder, or both. In short order you learn that driving in Mongolia is organic. You not only have to know your car and its limitations (hint: it’s capable of far more than you might think), you have to know your skills and your limitations (hint: you know a lot less than you might like to believe). Perhaps most importantly you have to understand the topography of the countryside and predict where water will collect, because where there’s water there’s craters and potholes. If you can’t learn the lessons the road is trying to teach you, either your car will die or you will. At 40 mph there’s a lot of learning and a lot of processing going on. We soon realized that to stay alive we’d have to cut our driving shifts from the vague “however long we wanted” down to a maximum of two hours. In the last few days we have crossed rivers, sand dunes, rock strewn alleys, marshes, mountains, and climbed 8,500’ passes. We spanked Swifty pretty hard more than once (her bumper is zip-tied on now) and so far she has bounced back. At one point as we zoomed along on a river of mud we worryingly started losing power. Turns out that for almost 50 miles Swifty was firing on only two cylinders - one of her spark plug leads had shaken loose during our third stream crossing. Another time screeching metal on metal sounds made us stop and remove the front right tire for an inspection. Turns out we had inserted a few shards of gravel in the brake caliper after a failed attempt at jumping over a berm. But when you’re doing 40mph, steering by compass, watching for the dips and the cliffs, then accelerating through the curves, Swifty and Mongolia are the best fun on four wheels there is!